Direct flights from Vancouver, Abbotsford, Kelowna, Calgary, Edmonton, Toronto and Seattle, Washington arrive at Victoria International Airport. 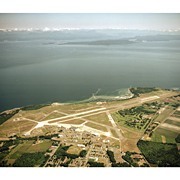 Victoria's airport is located near Sidney, a 22 kilometer drive from downtown Victoria. Click on the following link for up-to-date information about flights to Victoria International Airport . Non-stop flights from Vancouver, Calgary and Edmonton arrive at the Comox Valley Regional Airport in Comox. Charter flights also connect Comox to Puerto Vallarta, Mexico. Detailed information about flights to Comox can be found at the Comox Valley Regional Airport website. Flights connecting from Boeing Field in Seattle, Washington to the Campbell River Airport are offered by Helijet International. Campbell River Airport is a 40-minute drive from the Comox Valley. Information on schedules and reservations: 1-800-665-4354. Flights arriving from the Lower Mainland including Vancouver International Airport, Bounbary Bay Airport, and Abbotsford Airport. There is also an air service between Whistler and Nanaimo provided by Sea to Sky Air.